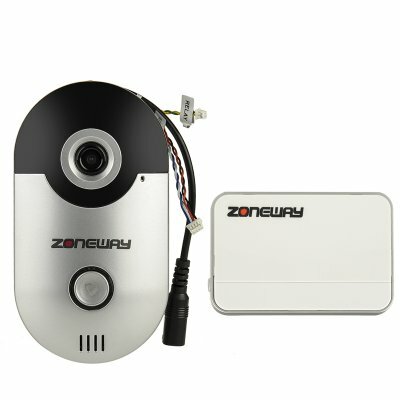 Successfully Added Zoneway Wireless Video Door Bell Intercom - Two-Way Audio, Night Vision, Motion Detection, Door Lock Control, Android + iOS to your Shopping Cart. The ZONEWAY ZD-D1 Smart Wi-Fi Doorbell system is the perfect doorman and guardian to your home. With two way audio, motion detection and the ability to take snap shots and recordings of your guests this wireless doorbell will let you screen visitors to your home and day or night and can be connected up to an electronic door lock giving you remote control to unlock the door. These means that you can let people in without having to walk to go near the door, a great bonus for people who may have difficulty getting about the house as they can let people in without you ever having to get up. Compatible with Android and iOS devices this wireless doorbell can be controlled through your phone or tablet. With a color CMOS sensor and two-way audio you can see and talk directly with people at the door via your Smartphone or tablet and because this device uses Wi-Fi you can access it throughout your home and the P2P support makes remote access quick and easy. Using motion detection you can be notified via the alarm of anyone in proximity to the door bell and with 4 IR LEDs you can even view people up to 10 meters away when it is dark outside. This complete wireless doorbell kit comes has all the fittings and adapters you need so installation kept simple and its durable design and IP66 rating will ensure its protected from the elements so as it can keep you secure and notify you of visitors for years to come. This Wi-Fi Wireless Door Bell Intercom comes with a 12 months warranty. Brought to you by the leader in electronic devices as well as wholesale security products, Chinavasion..